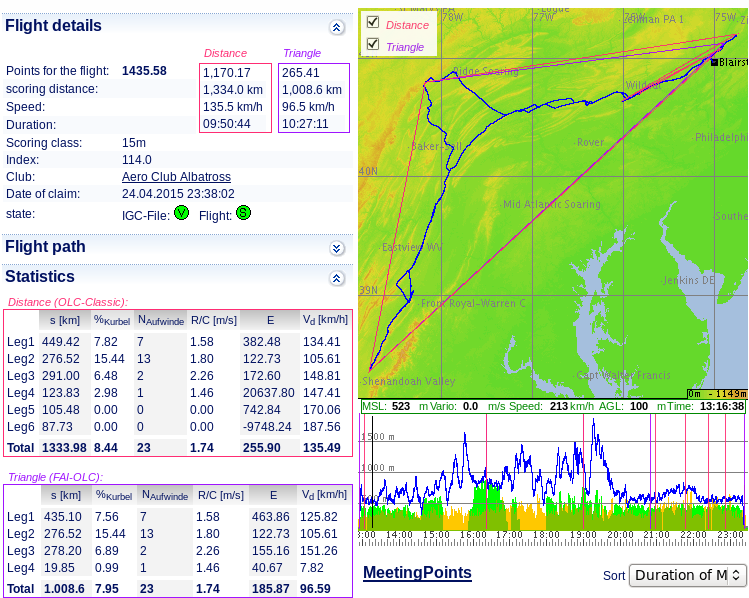 The OLC, Online Contest, is an informal and friendly internet competition where glider pilots upload their GPS data files and are automatically scored based on factors such as distance and achieved speed. More than 10,000 pilots worldwide participate in the OLC and the numbers are growing every year. The OLC is an excellent chance for pilots to improve their skills. By analyzing and comparing flight statistics on OLC, or by downloading the flights logs for a more detailed PC analysis, pilots can see the specifics of why another pilot was able to fly further and faster – a great learning tool. ACA is regularly a high scoring club in the OLC underlining our excellent location and soaring conditions. 1000km triangle flight flown from Blairstown.